2017 Graves as Composite Objects -- The Burial Record of Prehistoric Liangshan, Southwest China. Cham, Switzerland: Springer. 2014 The Crescent-Shaped Cultural-Communication Belt: Tong Enzheng's Model in Retrospect. BAR International Series 2679. Cambridge: Archaeopress (edited volume) (abstract, table of contents). "Keramik = Kultur? - Das Problem der Kulturdefinition in der euroamerikanischen und der chinesischen Archäologie." In Vom Wesen der Dinge - Realitäten und Konzeptionen des Materiellen in der chinesischen Kultur, edited by Grete Schönbeck and Phillip Grimberg. Wiesbaden: Harassowitz. "Ceramic Production in Prehistoric Northwest China: Preliminary Findings of new Analyses on Old Material from the Museum of Far Eastern Antiquities, Stockholm," with Ole Stilborg. Journal of Archaeological Research: Reports 23:104-115 download pdf. "The Archaeology of the Tibetan Plateau." In: Encyclopedia of Global Archaeology, ed. by Claire Smith, pp. 1-14. Cham: Springer International Publishing (published online). "Roderick B. Campbell, Archaeology of the Chinese Bronze Age: From Erlitou to Anyang." Asian Archaeology (book review) (published online). “Ashaonao yizhi zhiwu yicun ji yanjiu” 阿梢脑遗址植物遗存及研究. In: Ashaonao jingqu lishi wenhua kaocha yanjiu baogao 阿梢脑景区历史文化考察研究报告, edited by Sichuan Daxue Kaoguxi 四川大学考古系, Jiuzhaigou Fengjing Mingshengqu Guanliju 九寨沟风景名胜区管理局, Huashengdun Daxue Renleixuexi 华盛顿大学人类学系, Abazhou Wenwu Guanlisuo 阿坝州文物管理所, pp. 90-109. Chengdu: Bashu Shushe 巴蜀书社, with Jade d’Alpoim Guedes and Amanda H. Schmidt download pdf . "Landscapes of Prehistoric Northwest Sichuan: From Early Agriculture to Pastoralist Lifestyles" (with Jade d'Alpoim Guedes). Journal of Field Archaeology download pdf . "Shiqian shiqi Sichuan Liangshan diqu de wenhua dili yu quyu jiaoliu" 史前时期四川凉山地区的文化地理与区域交流. Nanfang minzu kaogu 南方民族考古 12:27-33 . "'Book Review of The Ancient Highlands of Southwest China: From the Bronze Age to the Han Empire by Alice Yao. Oxford: Oxford University Press, 2016. 288 pp” (book review). Cambridge Archaeological Journal (published online). "Early Cultural Developments of the Eastern Rim of the Tibetan Plateau: Establishing a New Chronological Scheme for the Liangshan Region." Asian Perspectives 56.1: 2-54 download pdf . "Book Review of Ancient Central China: Centers and Peripheries along the Yangzi River, by Rowan K. Flad and Pochan Chen." Asian Archaeology 4:135-142 download pdf . "The Cultural Other and the Nearest Neighbor: Han-Yi relations in Zhaojue County, Southwest China." With Zhao Deyun. Asian Ethnicity 17.2; 273-293 download pdf . "The Problem of Typology in Chinese Archaeology." Early China 39: 21-52 dowload pdf . "Wenhua chuanbo, renqun yidong yu wenhua yingxiang -- yanjiu wenhua jiaoliu de fangfa lilun he xinan diqu yu beifang caoyuan wenhua de guanxi 文化传播、人群移动和文化影响——研究文化交流的方法理论和西南地区与北方草原文化的关系." Nanfang minzu kaogu 南方民族考古 11: 67-90 download pdf . "Environmental Preconditions and Human Response: Subsistence Practices at Prehistoric Settlement Sites in the Liangshan Area, Southwest China." Asian Archaeology 3:39-94 dowload pdf . "Cong shiqi laikan Sichuansheng Liangshanzhou shiqian ren he huanjing guanxi 从石器来看四川省凉山州史前人和环境关系." In: Yige kaoguxue wenhua jiaohuiqu de faxian -- Liangshan kaogu sishinian 一个考古学文化交汇区的发现——梁山考古实施年, Vol. 1, pp. 215-236. Chengdu: Sichuan Daxue Chubanshe dowload pdf . "Qingzang gaoyuan dongyuan de shiqian renlei huodong -- lun duoyuan wenhua 'jiaohuidian' de Sichuan Liangshan diqu 青藏高原东缘的史前人类活动——论多元文化‘交汇点’的四川凉山地区." Sichuan Wenwu 四川文物 2: 40-47 download pdf . "Early Evidence for the Use of Wheat, Barley, and Flax as Staple Crops on the margins of the Tibetan Plateau." With Jade d'Alpoim Guedes, Lü Hongliang, and Amanda H. Schmidt. Proceedings of the National Academy of Sciences of the United States of America PNAS 112(18):5625-30 download pdf . "Metal, Salt, and Horse Skulls: Elite-Level Exchange and Long-Distance Human Movement in Prehistoric Yanyuan (Southwest China)." In: The Crescent-Shaped Cultural-Communication Belt: Tong Enzheng's Model in Retrospect, edited by Anke Hein. BAR International Series 2679, pp. 89-108. Cambridge: Archaeopress dowload pdf . "Diffusionism, Migration, and the Archaeology of the Chinese Border Region." In: The Crescent-Shaped Cultural-Communication Belt: Tong Enzheng's Model in Retrospect, edited by Anke Hein. BAR International Series 2679, pp. 1-17. Cambridge: Archaeopress dowload pdf . “Xifang de Zhongguo kaogu yanjiu dongtai - Yi 76 jie Meiguo Kaogu Huiyi weili” 西方的中国考古研究动态—以76届美国考古学会议为例. Nanfang Minzu Kaogu 9 南方民族考古第九集: 451-463 dowload pdf . "Interregional Contacts and Geographic Preconditions in the Prehistoric Liangshan Region, Southwest China." Quaternary International 348 (October 2014): 194-213 (published on website) download pdf . Entries on Tang Ceramics and Metal Objects in the Exhibition Catalogue Xi’an – Kaiserliche Macht im Jenseits, Kunst- und Ausstellungshalle der Bundesrepublik Deutschland, 21. April bis 23. Juli 2006. Mainz: Philipp von Zabern. Guo Meng. 2017. "Variability in Pottery Firing Technology: Choice or Natural Development?" Chinese Archaeology 17.1: 179-186 download pdf. 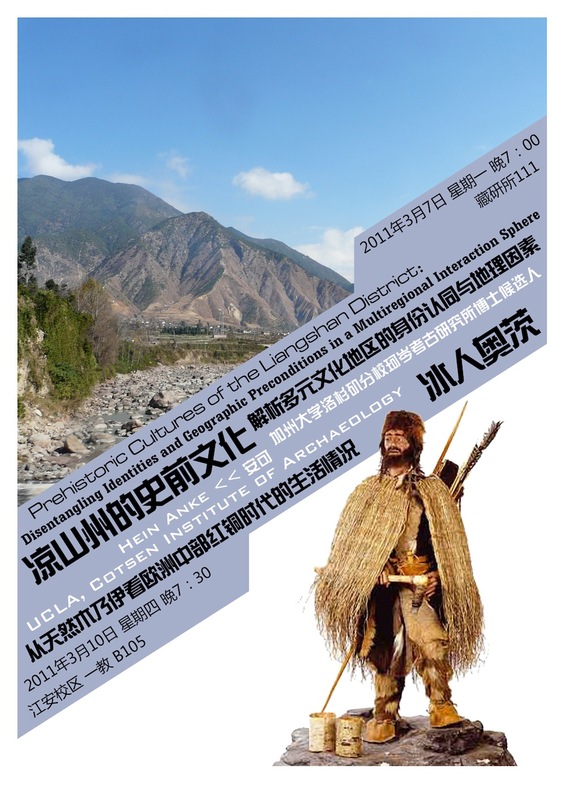 Lü Hongliang 2016: "Neolithic Age of Western Tibet: A Trans-Himalayan Perspective." Chinese Archaeology 16.1 download pdf. Institute of Archaeology of the Academy of Social Sciences et al. 2016. Gurugyam and Chuvthag Cemeteries in Ngari Prefecture, Tibet." Chinese Archaeology 16.1: 27-48 download pdf. Xinjiang Institute of Cultural Relics and Archaeology. 2015. "The 2013 Excavation of the Habqihan Sala Cemetery in Hejing County, Xinjiang Uygur Autonomous Region." Chinese Cultural Relics 2.1-2:182-210 download pdf. Shi Jingsong. 2015. "On the Emergence of the Domesticated Chicken as seen from Finds of Bronze Chickens in Southwest China." Chinese Archaeology 15.1:175-182 download pdf. Zhu Fenghan. 2014. "The Relationship between the Shang and the Ethnic Groups on the Northern Frontier as reflected in the Northern-Style Bronzes unearthed from Yinxu Site." Chinese Archaeology 14.1:155-169 download pdf. Zhengzhou City Institute of Cultural Relics and Archaeology. 2014. "Preliminary Excavation Report of the Wang-Mang Period Tomb M26 in the Zhouyuan District, Zhengzhou, Henan." Chinese Cultural Relics 1.2-4:112-118. Yang Fufei et al. 2014. "Longcheng Township in Qin'an, Gansu." Chinese Cultural Relics 1.1:447-452. Yang Yong. 2013. "On the Kele Culture." Chinese Archaeology 13.1: 186-191 download pdf. Zhang Chi. "The Qujialing-Shijiahe Culture in the Middle Yangtze River Valley," and: Cheng Honghai: "The Qijia culture of the Upper Yellow River." In: A Companion to Chinese Archaeology, ed. by Anne P. Underhill. Yang Jianhua. 2012. "Differentiation among Two Types of Cultural Remains in Northern China during the Eastern Zhou Period: On the Relationships among the Rong, Di, and the Hu." Chinese Archaeology 12.1:136-184 download pdf. "Keramikproduktion entlang des Wei-Flusses im Neolithikum und in der Gegenwart: Einblicke aus der Ethnoarchäologie", invited presentation at the Goethe-Universität Frankfurt, 22 November 2018. "The Power of Chinese Jade and Bronze: Fu Hao as Collector and Military General", invited talk at the Silk Road Society, Oxford, 11 October 2018. "Cooking and eating in prehistoric Northwest China." Talk in ARgo Seminar Siers on Staple Foods in China, Oxford, 10 October 2018. "How to bury and Emperor: the Logistics of Bulding the Grave of the First Emperor of Qin", linvited talk at Compton Verney, 5 October 2018. “Zhongguo Weihe liuyu taoqi shengchan de minzu kaogu yanjiu”中国渭河流域陶器生产的民族考古研究, invited talk at Sichuan University, 13 September 2018. Series of invited talks on ceramic analysis at the Chinese University of Science and Technology, Hefei, 3-5 September 2018: “Zhongguo Weihe liuyu taoqi shengchan de minzu kaogu yanjiu” 中国渭河流域陶器生产的民族考古研究, “Jinshu, yanye, matougu: zai Yanyuan deiqu shiqian wenhua jiaoliu he changtu renlei yidong” 金属、盐业、马头骨：在盐源地区史前文化交流和与长途人类运动, “Cong Gansu he Ruidian lai kan Zhongguo xibei diqu shiqian yhitao jishu” 从甘肃和瑞典来看中国西北地区史前制陶技术. “From Stockholm to Gansu and back: New Insights on Neolithic Chinese Ceramics from the collections of the Museum of Far Eastern Antiquities, Stockholm.” Paper presented at the Conference of the European Association of Asian Studies, Glasgow, August 29 – 1 September 2018. “Xindian site, Xindian culture, and Xindian ceramics: new insights from Gansu and Stockholm.” Paper presented at the Conference of the Society of East Asian Archaeology, Nanjing, China, June 8–12, 2018. “The Relationship between Dadiwan, Yangshao, and Majiayao: Potential Insights into an Old Debate from New Methods of Ceramic Analysis.” Paper presented at International Symposium on Neolithic Culture and Technology at Dadiwan, Qin’an, Gansu Province, May 28-30, 2018. “How to bury an Emperor: The Logistics of Building the Grave of the First Emperor of Qin”, Invited Presentation at Trinity College Dublin, 8 March 2018. “Homogeneity in form, diversity in technique or vice versa? – Ceramic traditions in Neolithic and Bronze Age Northern China.” Paper Presented at the 10th Archaeological Workshop on Scientific Analyses on Prehistoric and Early Historic Ceramics: Methods, Range of Applications and Evaluation Possibilities, University of Hamburg, Germany, 11 February 2017. “Soil, Hands, and Heads – An Ethnoarchaeological Study on Local Preconditions of Pottery Production in the Wei River Valley (Northern China).” Paper presented at the 82nd Annual Meeting of the Society for American Archaeology (SAA) Vancouver, 29 March - 2 April, 2017. “Xindian yizhi, Xindian wenhua, Xindian taoqi: cong Gansusheng he Ruidian de xin jiaojie” 辛店遗址、辛店文化、辛店陶器: 从甘肃省和瑞典的新视角(Xindian site, Xindian culture, and Xindian ceramics New Insights from Gansu and Stockholm). Paper Presented at th 8th International Research Conference on Ancient Cultures of Mongolia, Transbaikal Siberia and Northern China in Changchun, Jilin Province, China, 11.-15. September 2017. “Xindian wenhua taoqi yanjiu yu lijie xibei diqu shiqian shequn de yiyi” 辛店文化陶器研究与理解西北地区史前社群的意义(Insights on Group Identities in Prehistoric Northwest China gained from Research on Xindian Ceramics). Invited Presentation at the 临洮县辛店文化研究会一届三次年会 (Third Annual Conference on Research on the Xindian Culture in Lintao County), Xindian, China, 20 May 2017. "Zuowei 'fuheti' de muzang: kaifa xin de fenxi moxing he fenxi fangfa" 作为“复合体”的墓葬：开发新的分析模型和分析方法. Invited Presentation at Sichuan University, May 2, 2017. "Soil, Hands, and Heads - An Ethnoarchaeological Study on Local Preconditions of Pottery Production in the Wei River Valley (Northern China)." Paper Presented at the 82nd Annual Meeting of the Society for American Archaeology, Vancouver, 29 March - 2 April, 2017. “Xifang de Zhongguo kaogu yanjiu dongtai – yi 76 jie Meiguo Kaogu Xuehui weilie 西方的中国考古研究动态——以76届美国考古学会议为例”. Invited Lecture at Sichuan University, Chengdu, in June 2011. “Liangshan diqu de shiqian wenhua – jiexi duoyuan wenhua diqu de shenfen rentong yu dili yinsu 凉山州的史前文化---解析多元文化地区的身份认同与地理因素’. Invited Lecture at Sichuan University, Chengdu, March 2011. “(Re-)Establishing Texts? – The Question of the ‘Authenticity’ of the Chinese Textual Heritage as seen from Excavated and Received Material on the Guicang.” Paper Presented at the Conference on Chinese Palaeography: The Present and the Future at the University of Chicago, May 14, 2006. Zur Überlieferungstreue früher chinesischer Texte: Zwischen Fälschungsvorwurf und Textgläubigkeit. Invited Lecture at the Regular Meeting of the Rotary Club Heidelberg-Schloss, February 23, 2006.